Recent observations from satellites and ground stations suggest that atmospheric ozone levels for March in the Arctic were approaching the lowest levels in the modern instrumental era. What those readings mean for the remainder of the year is unclear. But what they mean for the long-term is that the recovery from human-induced ozone depletion is an uneven climb. These maps of ozone concentrations over the Arctic come from the Ozone Monitoring Instrument (OMI) on NASA’s Aura satellite. The left image shows March 19, 2010, and the right shows the same date in 2011. 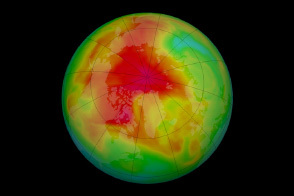 March 2010 had relatively high ozone, while March 2011 has low levels. The large animation file (linked below the images) shows the dynamics of the ozone layer from January 1 to March 23 in both years. In mid-March, scientists from Germany’s Alfred Wegener Institute announced that Arctic ozone levels had been cut in half in the waning weeks of winter, according to a network of 30 ozone sounding stations spread around the region. Data from OMI (shown above) also confirmed a depletion. OMI is a spectrometer that measures the amount of sunlight scattered by Earth’s atmosphere and surface, allowing scientists to assess how much ozone is present at various altitudes, particularly the stratosphere. Ozone is destroyed when chlorine- or bromine-based compounds—especially chlorofluorocarbons (CFCs) —break into their free atoms and combine with the oxygen. That process is amplified when the stratosphere is especially cold, which it has been in recent weeks. 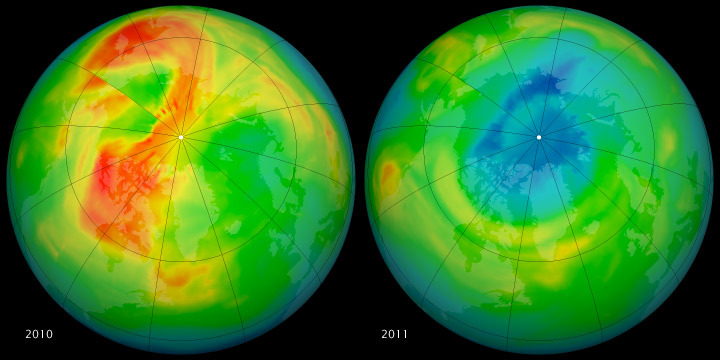 On a global scale, the ozone layer is still on a long-term course for recovery. But for decades to come, there remains a risk of major ozone losses on yearly or regional scales. 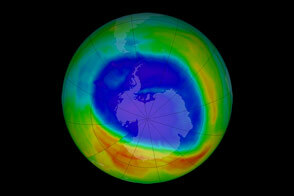 NASA image by Rob Simmon, with data courtesy of Ozone Hole Watch. Caption by Mike Carlowicz and Kristyn Ecochard. Recent observations from satellites and ground stations suggest that atmospheric ozone levels for March in the Arctic were approaching the lowest levels in the modern instrumental era.